If you don't know, I'm 3/4 Irish. I wear my green on St. Patrick's Day, I drink beer and sing along to any song on the radio. Growing up in an Irish Household is fun. You celebrate everything! And everyone gets together to partake in this feast. Unfortunately, our families grow and each branch does their own thing. Three years ago, I decided I'd host my own little party. 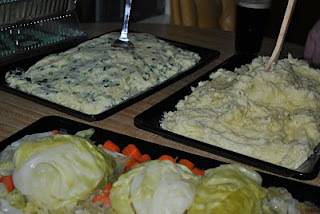 Just a few friends, some great food, both traditional Irish and Irish-American dishes. Many things stay the same, the desert always changes. Sounds like a daunting menu, right? It was. 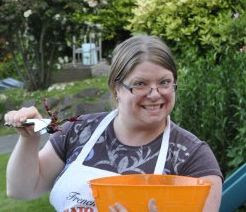 I did hours of Prep Friday night, got everything packed, slept well, then while loading the last box, Disaster struck. While walking with the last box the last few feet to my truck, I tripped off the sidewalk, rolled my ankle, smashed my knee into the curb and landed on my side. I felt nothing but shock. I screamed out a few curse words on my neighbor checked my ankle for breaks. Nothing broken, I made sure that everything was okay after my ungraceful tumble. Thank you to my wonderful neighbor for going back up the three flights of stairs into my apartment and getting me ice packs and Advil. Sent a text to my friends and I was on the way. Suffice to say, I am only posting the menu tonight as the ankle is not hurting, but extremely swollen and I need to lay down. 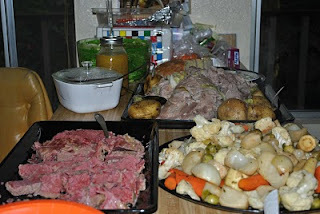 Here's a few pictures of the meal to tide you over until I get the recipes uploaded! 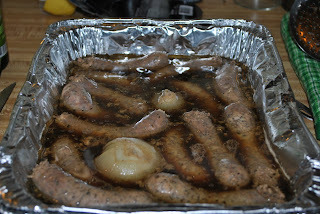 And here is our famous bangers, getting ready to bake in some Guinness!